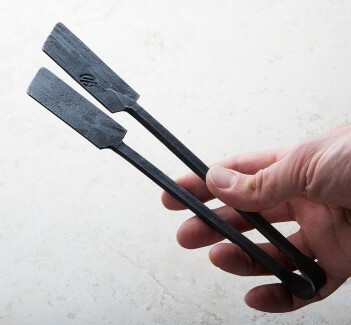 Hand-forged for a rustic feel, designed in Andrew Dohner's contemporary style, this gorgeous 3-pc kitchen utensil set in hand-forged carbon steel will be the envy of any dinner guest. Long handles and robust construction make these tools perfect for those large jobs whether it's pulling every morsel from the caldron using the slotted ladle, carving and turning a roast with the fork or scooping and flipping on a grill pan with the spatula. The forged wall rack is easily mounted on any wall using two screws that remain hidden behind the fork's handle. Andrew Dohner is a third-generation metal worker from Pennsylvania who has focused his trade on sculptural and functional wares for the home and kitchen. Building each piece by hand at his shop in the US state of Oregon, Andrew's contemporary, purpose-driven design aesthetic is illustrated beautifully in this matching set of daily-use tools for the kitchen. Ladle: 14.5" long, 3" x 3" head. Fork: 14" long, 3" tines. Spatula: 15" long, 3.5" x 4" head. Wall Rack: 12" wide.